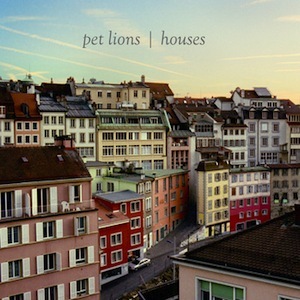 If you’re clued in to the Chicago music scene, then you’ve heard the name “Pet Lions” thrown around over the past few months. These guys have been making a lot of noise in the Second City as of late, and have built a substantial local following since Houses, their first LP, dropped in May. Those familiar with the band before the release of Houses would have undoubtedly been taken aback by their new sound. Soft Right, the group’s 2010 EP, resembles a generic-but-solid hybrid of The Strokes and Tokyo Police Club. Give “Roman History” a listen, and you’ll hear exactly what I mean. Yeah, it’s good, but is another derivative local indie rock band what we need? Pet Lions sure don’t think so. From the opening fuzzed-out riff of “The English Room,” it’s clear that hey have taken things in a very different direction this time around. In fact, one could be forgiven for thinking that Houses was made by a different band altogether. While the guys are still playing the same instruments—guitar, bass, keyboard, drums—they’re going beyond the basic verse-chorus-verse structure that so many bands seem to be permanently stuck in, while crafting their own unique sound. The most notable change on Houses, however, is the average tempo. Pet Lions have figured out how to make great songs without relying on really fast beats and an ADD-rock mentality. There are bigger bands out there that still haven’t gotten this skill down, and with a style so original and good, there’s no reason that Pet Lions couldn’t be a nationally-recognized name in the near future. Sure, some will prefer the bands earlier stuff—it’s easier to dance to, I’ll give it that. Me, I’ll take the inventive and creative sound that populates Houses any day. Haters gon’ hate.